Last time in first Machine Learning Course Post – we did the first Project on bike-sharing data – predicting what daily bike usage was for a 2 month period based on almost 2 years of prior data. In Project 2 – we have an image classification project – this is a precursor exercise before that. Here’s the Github code for this exercise. Our task is to take some data set of images — a folder with lots of individual .PNG files – each pre-labeled with a filename corresponding to what label that image file is. For example: A392.png = a 28×28 pixel image of the letter A. All the necessary packages should be installed for you. 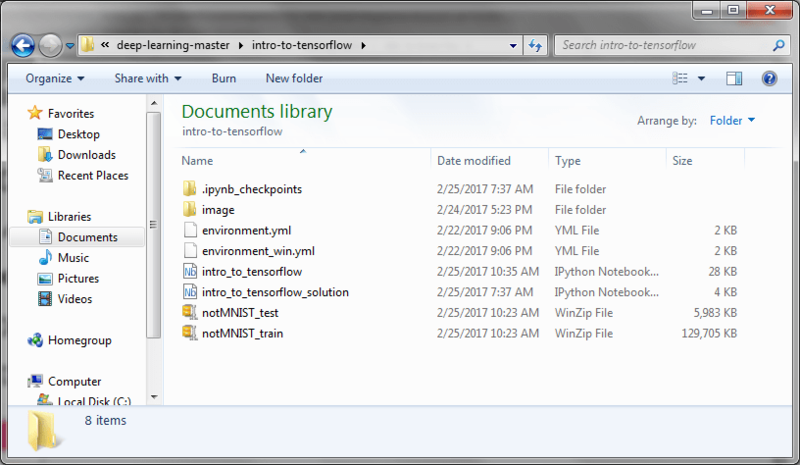 So then in Anaconda, I change directory into my /intro-to-tensor-flow/ directory and run jupyter notebook so I can access the python file in the jupyter notebook environment. # Download the training and test dataset. # Wait until you see that all files have been downloaded. 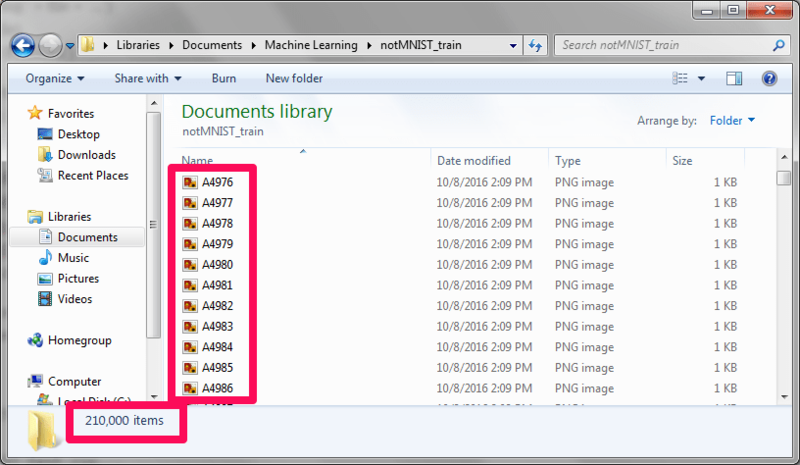 If I download the notMNIST_train.zip file and look inside, I see filenames that look like the below. They're a bunch of .PNG files and the first letter of each filename represents the "label" for that image. So nowI have my two zip files – one for training and one for testing. Using a loop function (we use the “with ZipFile(file) as zipf” function below instead of a traditional for loop) – we individually load each image data into a numpy array that we name ‘feature’ – without the ‘s’ at the end. A4978.PNG - would extract out the "A" - because this would be the label for that image. # Get the the letter from the filename. This is the letter of the image. The resample function here I’m not sure about as the parameters “train_features” and “train_labels” are on both the left and right side. 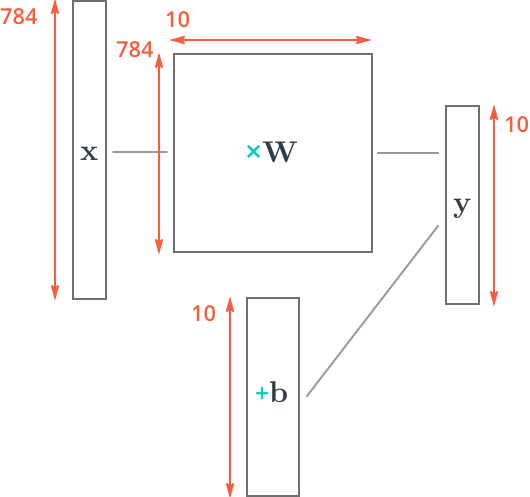 # Set flags for feature engineering. This will prevent you from skipping an important step. # Wait until you see that all features and labels have been uncompressed. Each 28×28 image is in grayscale – so each pixel is represented by a number between 0 and 255 according to how dark that pixel is. # Since the raw notMNIST image data is in grayscale, the current values range from a min of 0 to a max of 255. # so the “image_data” parameter passed in is a number between [0 – 255] on grayscale. Maybe the image is overall really dark. Maybe the image is overall really light. That shouldn’t change the fact that this image is of the digit ‘2’ – for example. By normalizing, we remove the noise of how dark or light the image is – and instead, focus on the differences in the shades of color. This is a best practice in machine learning. We would specify the min/max boundaries of what we would like to fit it in (values ‘a’ and ‘b’) – and what the original scale was (values ‘grayscale-min’ and ‘grayscale-max’). So we are passing the parameter ‘train_features’ – which is a big numpy array of each pixel data — this represents the ‘image_data’ above that we would do calculations off of. Another way to normalize this around mean = 0 — is to subtract the midpoint from each image data value and divide by that midpoint. This would result in a mean of 0 and values between -1 and 1. 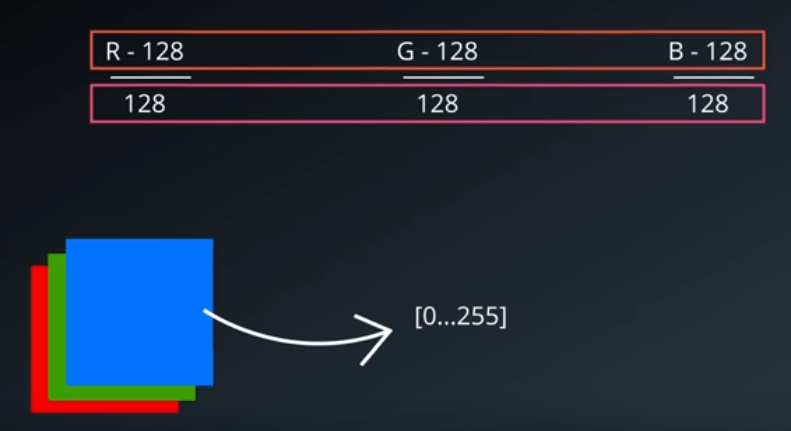 With the RGB color or gray scale – the midpoint is 128 – so we if we subtract the ‘image_data’ from 128 and divide by 128 – we can normalize around mean = 0 and range between -1 and 1. So this is a second way of normalizing. So ‘feature’ is essentially our input X of vector size 784.